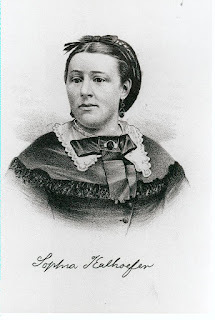 a German immigrant who settled in Kansas with her family, married the neighbor (the only neighbor at the time) and joined her husband of only one year in establishing Hollenberg Station. Sophia's first home at this location was a one-room log cabin with a dirt floor. That one room served as kitchen, living room, bedroom, and store. If I had to feed a family using only a box stove like the one pictured below, we'd all be in big trouble, but box stoves were a great improvement over fireplaces. They provided even heat and helped eliminate the threat of long skirts and petticoats catching fire from the open flames in a fireplace. The lack of an oven would have made fine wheat bread impossible, but Sophia could have prepared corn bread and soda bread in iron pans atop the stove. Fueled by the abundant firewood available nearby, this little stove would have kept the log cabin warm all through the long Kansas winters. While the image of a one-room log cabin is often thought of as a synonym for "loneliness," because their business was located on the California-Oregon Trail, the Hollenbergs probably saw as many as 15,000 people a year pass by. Yes. Thousand. Two years after settling into the log cabin, the Hollenbergs added a post and beam room to one side of the log cabin and a lean-to kitchen on the other. Imagine Sophia's joy at having a dedicated kitchen! Hopefully that included a bigger and better stove, too. A root cellar beneath the kitchen (see the trap door in the photo below) and more expansion continued until the station became what it is today, still located on its original site and cared for by the State of Kansas as a historic site. Today, visitors cross the Oregon trail when they walk from the visitor's center to the station itself. Hollenberg Station was the 1800s equivalent of convenience store, motel, and restaurant/tavern. Customers would have included immigrants headed west, freighters, Pony Express riders, stagecoach drivers, and stagecoach passengers. Hollenberg offered Sophia's hot meals (billed at 26 1/2 cents each), supplies, postal service (letters could be left for the stagecoach to transport to various destinations), and even a bed for the night, the latter accessed by steep stairs leading to an unfinished attic above the main rooms. counter in the station's main room--and the tavern. Together--and with the help of Louisa, their niece and a young man Gerat helped immigrate from Germany--the Hollenbergs produced much of the food served at their station. Travelers in the late 1800s mentioned a large garden and even an orchard at Hollenberg. Every fall, meat was preserved by drying, smoking, or salting. Garden produce was dried and stored in the root cellar beneath the kitchen. Canning would have also been possible by the late 1800s. After the telegraph put the Pony Express out of business, the Hollenbergs continued to operate their store, post office, and stage station until 1872, when they moved into Hanover, a town Gerat had helped lay out--a town named for his home in Germany. Gerat encouraged other Germans to immigrate to the area and began to deal in real estate. He also served three terms in the Kansas Territorial Legislature. Sophia was widowed in 1874 when Gerat died on a trip to Germany. He was buried at sea. She remarried Judge William Kalhoefer in 1875. The couple had one son who died in infancy. Her tombstone is gray granite and it bears only the name Sophia Kalhoefer, her birth date, and her death date (1914--one year after my own mother was born). No one seeing Sophia's gravestone would imagine the history behind the name or that this woman was witness to the Oregon Trail and the Pony Express. See more photos of Hollenberg Station and plan your visit at http://www.kansastravel.org/hollenbergstation.htm. What's your favorite historic site? Why? Answer to enter a drawing for a free copy of Stephanie's newest book. Keep reading to learn more about it. features young Annie Paxton who's been "hornswoggled" into working as a cook at a Pony Express Station near Fort Kearney, Nebraska. Sophia Hollenberg has a cameo appearance ... and even shares a recipe. I loved this post! I enjoy stories about all aspects of the pioneering era of our country. I would love to see this place. Thanks for the giveaway! I have learned so much history from Mrs Whitson's books! I just finished reading Daughter of the Regiment and I am excited to have a new book to read. My husband and I have been talking about going to see the Rock Creek station because he has been watching the Young Riders. Maybe we could add the Hollenberg station to our itinerary. I think you could easily do both in a day ... unless you're like me and like to meander LOL. My characters to go past Rock Creek Station of course, but I had to shorten the scene. Originally Annie met Wild Bill there ;-). Of course that was before he was known as "Wild Bill." My 97 year old Mother and I absolutely LOVE your books! I just got this new one on Kindle, but she can't read my kindle... Her fingers are always changing the pages or app at the wrong time. I would love to have the book for her. What a blessing to think of TWO generations liking my books. THANK YOU for telling me! My favorite historic site is Ft. Davis in Texas. We used to go there a lot when I was growing up because it was only a couple of hours from where we lived and we would go camping at the state park close to it. I'm going to look up Ft. Davis. It's always fun to learn new history and I know very little about Texas. I already am getting your book, but wanted to say that I continue to enjoy your books and will share this history behind the book with our book club. I love anything about history....I remember seeing a marker and wheel ruts in Kansas where the Oregon Trail wagons used to cross. It's fun to imagine pioneers' lives. Looking forward to this book about the Sophia Hollenberg. Thank you for all your hard work, Stephanie, and sharing your gift. Bless you, Marilyn. You're such an encourager. I appreciate you. I love your books and wish this one could be mine. I don't really have a favorite historical site, I really haven't visited many. But I do like to visit some local historical society museums. There's quite a lot of Native American history here in Oregon/Washington. The Lewis & Clark trail is probably the most famous here! Messenger by Moonlight sounds like a great read. I don't know too much about the Pony Express, so it would be fascinating! Thanks for the chance to win a copy for myself! Those local museums can be so interesting. I read Undaunted Courage last year (about Lewis and Clark) and gained new admiration for those explorers. My favorite historic site is George Washington's home, Mt. Verson. Overlooking the Potomac....what a beautiful sight! I adore Mt. Vernon, and my 7-year-old granddaughter is fascinated by it after learning about it in school. I'm hoping she and I can visit together one day. My mother knew that kind of poverty, too, and thinking about what she endured makes me sad sometimes, too. My dad went hungry ... truly went hungry when he was a kid. We are SO blessed! Love ya back, dear lady. My favorite historical sight is Gettysburg. I know it is a sad place, but I found in so very interesting. There are som very many fascinating historical sights in the country of ours. I just visited the headwaters of the Mississippi this past week. Another absolutely fascinating historical sight - especially reading about how the explorers finally found it. I have not been to Gettysburg but walking any of those battlefields ... well. I always need Kleenex. Lots of Kleenex. Such an interesting post! Thanks for sharing, Stephanie. Thomas Jefferson's Monticello is one of my favorite historic sites. I am so old that when I visited Monticello we just drove up to the house and parked. Truly. Unforgettable day. Amazing man. Thank you for the fascinating post. Visiting the Battleship of Texas in La Porte, TX is fun and interesting. We have Navy men in our family so that would be a fascinating place for us to visit. Maybe someday. Very interesting post. And may I say that the cover of Messenger By Moonlight is gorgeous! Oops, I forgot to mention my favorite historical site. That would have to be Angel Island in the San Francisco Bay. I lived on the island for 3 months when I was about 12. I was staying with my sister and her husband, who worked on the island. It was a tourist attraction by that time, but a lot of the old buildings are still standing. Isn't that cover beautiful?! I was thrilled when I saw it. I can't imagine living on an Island ... but I'd be willing to give it a try LOL. I looked up Angel Island just now and if I'm ever in the SF area, I want to go. Thanks for coming back and posting about it.